Simple monitoring solution for Axis network video products The AXIS P7701 Video Decoder provides a simple monitoring solution by enabling analog or digital monitors/projectors to connect to and display live video from Axis network cameras and video encoders. In situations where only live video display is required - such as with a public view monitor at a store entrance, AXIS P7701 offers a more cost-effective solution than using a PC for connecting a monitor. AXIS P7701 can also complement a video management system by helping to offload the main server from decoding digital streams simply for display purposes. Full frame rate video decoding of H.264, MPEG-4 and motion JPEG AXIS P7701 can decode full frame rate video streams in H.264 and MPEG-4 in all resolutions up to D1. Motion JPEG can be decoded in all resolutions up to 720p (1280 x 720). The video decoder can provide either digital or analog video output. Video from any number of cameras can be shown in sequence. Alarm-triggered video and high-quality audio When an alarm is triggered in a network camera or video encoder, AXIS P7701 can be configured to automatically display alarm-triggered video. AXIS P7701 also decodes mono audio. 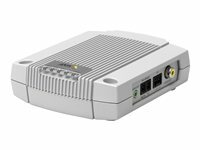 The video decoder can be powered either through Power over Ethernet or through an external power supply.